Located in the c. 1800’s Ebenezer Bayles/Stephen Swezey house, the Three Village Historical Society is the home of the interactive Culper SPIES! Exhibit. Samuel Thompson built this home and became a successful farmer. This house is one of the best examples of colonial timber frame construction. Samuel and his son Jon, were both successful farmers, Revolutionary War patriots and Town leaders. After the war, Morris Jayne ran a tavern here. It was moved in 1890 from its original foundation to its present location. Dormers were added, and the rear of the building was enlarged. In 1942 it was fully restored. During Colonial times the Long Island Sound was known as “Devil’s Belt.” Culper Spy Caleb Brewster would row past British guard boats and cross the Devil’s Belt to Connecticut, where he kept crews and boats for the cross-sound relay. Built by Ward Melville. A representation of the mills that once existed in the area from the 1660’s through 1936.
spy Caleb Brewster’s landing spots. A Federal-style house with a number of Colonial Revival features. Designed and owned by John Satterly, a general in the Long Island Militia. Once the site of a one-room school which was later moved. The horse and carriage shed was used by prominent families of Setauket who purchased stalls for their horses and carriages. The names of these families can still be seen on the rear wall of the stalls. The church is the second oldest continuing operating Episcopal Church in the United States. The cemetery contains the graves of early settlers of the town, Revolutionary War heroes, ship captains and industry leaders. Where many of the Strongs are buried, including Anna Smith Strong, aka “Nancy” in the Culper Spy Ring, and her husband Captain Selah Strong, who was captured and allegedly put aboard a British prison ship. He was imprisoned in the former Sugar House in lower Manhattan. 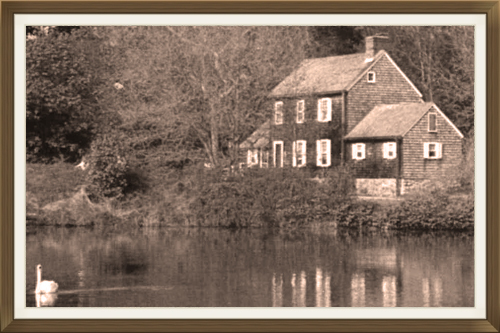 Although this home no longer exists, the sign marks the spot where Abraham Woodhull once lived. Woodhull, a.k.a Culper, Sr., was known for his active role in the Setauket Spy Ring. Woodhull would retrieve secret messages from Austin Roe. Woodhull would deliver the messages to Caleb Brewster who then passed the information along to Major Benjamin Tallmadge. Tallmadge hand-delivered the intelligence to General George Washington. During the Revolutionary War, the Village Green was the location of the “Battle of Setauket” a skirmish between Tory and Patriot troops which took place on August 22, 1777. Prior, it was called “Meeting House Green” where meetings were held during the early settlement period of the mid to late 1600’s. This was the site of the first meeting house and church in Setauket. The second church was built c. 1714, and was used as a fort by British Tory troops. The present church was built in 1812. The cemetery contains the graves of spy Abraham Woodhull, genre artist William Sidney Mount, and early settler Richard Floyd, grandfather of William Floyd. A school and community center honoring Richard Woodhull, an original Setauket settler and magistrate for Setauket to the General Court of Connecticut, and Major Benjamin Tallmadge, chief of George Washington’s Secret Service and Culper Spy Ring. This classic “saltbox” dwelling is one of the oldest buildings in the Three Village area. It was home to seven generations of the Brewster family, with the Reverend Nathanial Brewster as its first resident. Nathaniel’s great-grandson Joseph inherited the house around 1760, where he operated a tavern. Joseph’s cousin, Caleb Brewster, was a whaleboat captain who became famous for his role as junior officer in the Setauket (Culper) Spy Ring. In 1970 the house was deeded toThe Ward Melville Heritage Organization. The area where both Anna Smith Strong and Abraham Woodhull lived during their involvement in the Culper Spy Ring in the Revolutionary War. One of the earliest homes in the area, this was the miller’s home from before 1795 when Richard Woodhull sold the house to Isaac Satterly. This park is an area of approximately five acres, marked by a horseshoe-shaped path, surrounding the lower Setauket Mill Pond. The park was designed as an English-style park for the enjoyment of the public. 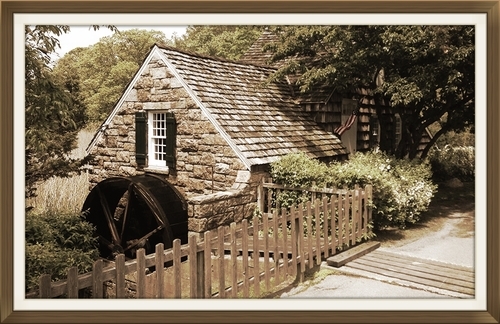 Within the park are a number of structures including the Greek Revival Setauket Post Office, a simulated grist mill, the cottage of the last working miller, and a 19th century barn.